Rourkiebunny just never learns, does he? 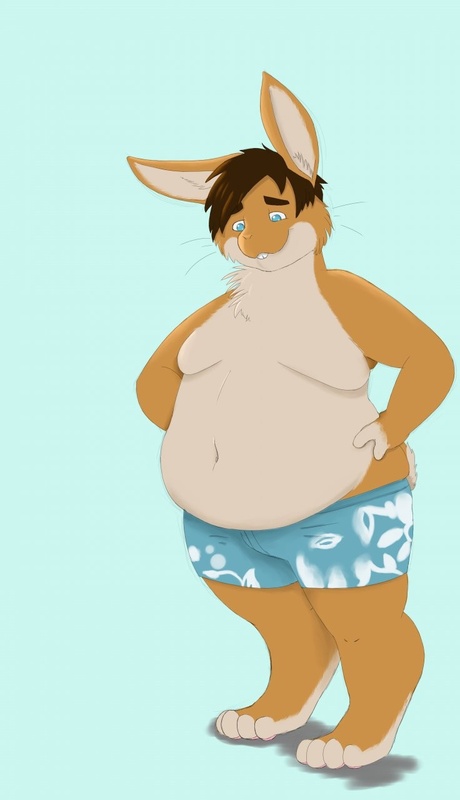 After a year of gorging and gluttony, he finds his swimsuit is even more snug than ever. Someone didn't get the memo that his clothes are going to keep shrinking if he eats like he has been. Oh well, I'm sure most of you won't complain. Oh goodness yes! Look at the muffin top and the way the shorts are straining and pulling! I love the comparison in size of both his yummy body and belly and the shorts! C-can I gives belly rubs? Those shorts are almost done for. Heh. Well, they certainly are getting an stretching currently. Looks like an nice spread. I *ahem* umm... don't wanna be one of those eerrrrrrrrrrrrrr--DEMANDING *ahem* sorry, um demanding fans, you know the ones who always seem JUST A LITTLE un-un-un-un-hinged? Hehehehe, because the last thing I wanna be remembered as is an un-st-st-st-st-STABLE, hehehe, little creep who NEEDS A PART THREE TO HAPPEN PLEASE hehe, but if there could *twitch* someday be a part *tic* three to this, I think I'd enjjjjjj-hahahahahahaha *stomps foot* ENJOY it very much, thanks, yes.IF it's perfectly convenient. Okay. I think that can be arranged... We'll see what happens.